Home Headlines Vampire: The Masquerade 5th Edition Pre-order LIVE! Vampire: The Masquerade 5th Edition Pre-order LIVE! Today we have a huge launch for Modiphius that we really wanted to share with you all. As we’ve grown over the last five years we’ve been able to bring together one of the finest collections of roleplaying games in the world. There have been RPG’s that were instrumental in changing the tabletop world and Vampire: The Masquerade re-defined what an RPG could be. We’re really proud to now add V5 to the Modiphius line up! We’re pleased to announce the pre-order is live for Vampire: The Masquerade 5th Edition, the classic returns with a streamlined, modern rules design, beautiful new full-colour art, and a rich story experience for new and returning players. This is a return to Vampire’s original vision, moving boldly into the 21st century. This new edition honours the deep story of the original, advancing the metaplot from where it left off and detailing exactly what has happened in the world of the Kindred up until tonight. The terror of the Second Inquisition, the conspiracies behind the Gehenna War, and the rekindling of the War of Ages: these are the building blocks of the modern V5 chronicle. 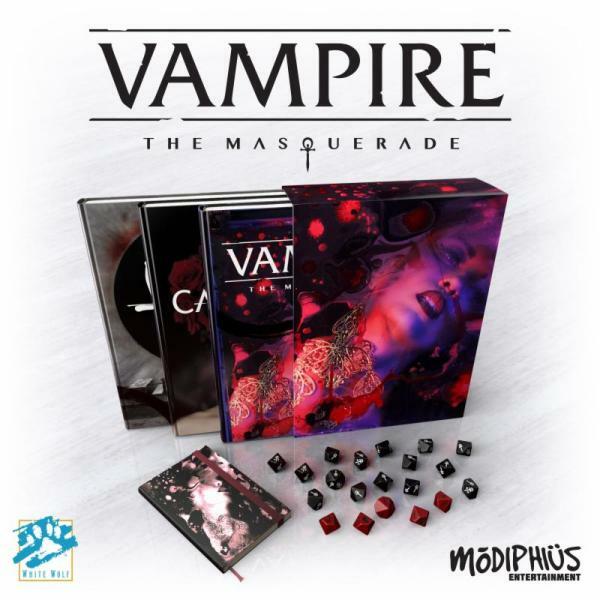 The ultimate game of personal and political horror roleplaying game, the Vampire: The Masquerade, pre-order is now live and will start shipping from August with the first release, the core book, available in stores from September. Choose your core book, from Standard, Deluxe and Luxury Versions (pictured), with fantastic cover art, rare finishes and in the Luxury version’s case, one of only five hundred ever being made! As a vampire you suffer the pangs of the Hunger, the relentless and terrible thirst for human blood. If you refuse to deal with it, it will overcome your mind and drive you to terrible acts to slake it. You walk this razor’s edge every night. Dark designs, bitter enemies, and strange allies await you in this World of Darkness. In the Anarch Sourcebook welcome to a blood thriller on the modern streets . For centuries the Anarch Movement enjoyed an uneasy truce with the Camarilla, but no longer. Now, the Unbound refuse to bow to the tyranny of their former allies and intend to claiming the nighttime streets as their own! In the Camarilla Sourcebook the global blood opera of the Camarilla story continues. As the eldest vampires begin to vanish, the Ivory Tower starts to crack under the weight of its own decay. Once it was the mightiest faction of vampires in the world, a stronghold of immortality. Now it retreats into a maze of neo-feudal conspiracies to protect itself against the deadly threat of the Second Inquisition, struggling to enforce the Masquerade in the face of modern technology. Supporting these core books and supplements are of wealth of Vampire 5th edition accessories including a Storyteller Screen, a high quality multi panel portrait format, featuring plenty of content to help power your chronicle. The exterior features beautiful rendered artwork from Vampire: The Masquerade, while the inside cover contains useful rules references, tables and charts for Storytellers and and accompany booklet will help you create on the spot hunts, as well as complete plots with plenty of guidance. There’s also a set of 20 official ten-sided dice for Vampire: The Masquerade 5th Edition. 15 black Vampire dice and 5 blood red Hunger dice, plus the Vampire 5th edition Notebook, with a lavish 160 page notebook with stylised borders featuring journal, map and others pages to illustrate your story. Finally for avid Vampire collectors, we have some amazing bundles, which range from the humble Slip Case edition which features core book and Camarilla and Anarch supplements, through Neonate, Ancilla, Elder and bundles, all the way up to the mighty top of the range Methuselah Bundle which features Luxury Corebook, Slipcase Set, Notebook, Storyteller Screen and Dice Set!